Thrush Crush has been empirically field tested for over 15 years, and has proven to be the go-to product for many farriers, veterinarians, and horse owners that find it important to utilize the best healing techniques that mother nature has to offer. Without using any chemical or unnatural compounds, Thrush Crush safely and effectively fights the microbial infections that lead to thrush, seedy toe, white line disease, and other forms of hoof rot. You too will find Thrush Crush to be an indispensable part of your barn's medicine kit. Thrush Crush is a 100% natural topical treatment for destroying unhealthy conditions of the hoof and creating a healthy environment for hoof tissue. The active ingredient, bee propolis, is a substance created by honeybees, rich in bioflavinoids, which honeybees produce to protect their hives from harmful fungal and bacterial infections. The same way that propolis is effective in the beehive, Thrush Crush works to kill thrush and other harmful conditions of the hoof. Our product is very concentrated, and a small amount does a tremendous amount of good. 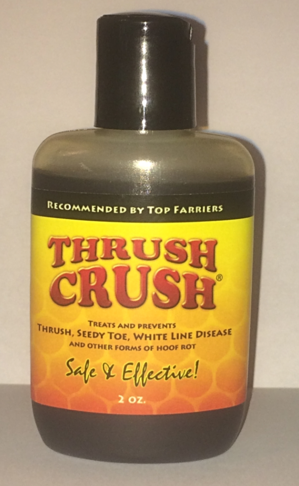 Thrush Crush is far superior to the many commonly used chemical products on the market today. Thrush Crush stands behind their product and knows you'll be satisfied with the impressive results of Thrush Crush or they will offer you your money back.